Clear Springs is located on 18,000 acres in Bartow, Florida, midway between Tampa and Orlando, and within 100 miles of Cape Canaveral. Clear Springs comprehensive vision is unique in that it incorporates agriculture production, conservation and economic development; elements seldom seen together in a development plan. 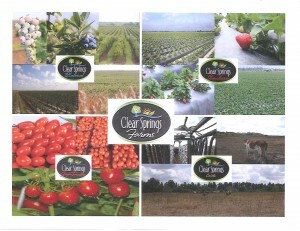 Clear Springs’ agriculture operations are focussed on cattle ranching and the production of blueberries, strawberries, and grape tomatoes. Agriculture plays an important role in the development of the Clear Springs’ property and will remain a land use priority. Long term master planning for Clear Springs’ 18,000 acres has been completed through the Optional Sector Plan approach. In addition to Agriculture, Clear Springs’ Master Plan includes a Corporate Research Park (anchored by education and workforce training through the Polk State College Advanced Technology Center), Industrial, Offices, R&D, Retail, and Hospitality, Recreation, and Conservation. At Clear Springs, our business model focuses on quality products, excellent customer service, and reinvesting earnings in both the land and in the community. For additional information contact Carole McKenzie at cmckenzie@clearspringsco.com or 863-534-1292.